Made from optimum quality polyester and 180 GSM polyester, our extensive collection of 70x70 square tablecloths is available in a wide variety of colors. Specific to meet all the requirements of your varied event table settings like wedding, formal parties, and suitable for home, restaurant and large venues, the tablecloths help the hosts to give a delicate and elegant finish to the table. Match with complementing overlays to create a spending table décor. 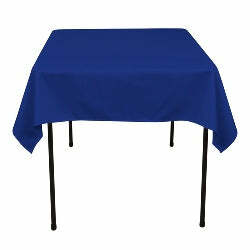 Highly durable, stain resistant, easy to care for, and having clean merrowed edges, the 70” square tablecloths are available at affordable prices, with fast and reliable shipping services.